The main difference between Perl and Ruby is that Ruby provides more support for object orientation than Perl. Perl and Ruby are two high-level, general purpose languages. Both these languages support paradigms such as procedural and object-oriented programming, but Ruby is more object-oriented than Perl. However, both languages have simple and easy syntax. They are commonly used for system administration, network programming, GUI and web development and many more. Perl stands for Practical Extraction and Reporting Language. It is a high-level programming language developed by Larry Wall. Moreover, it is open source, and the programmer can execute Perl programs in platforms such as Windows, Mac, and Linux. Perl is an interpreter-based language. Therefore, the interpreter converts each line in the source code into machine code. Thus, Perl is slower compared to languages such as C and C++. There are third party libraries to work with RDBMS such as MySQL, and Oracle. Also, this language works well with markup languages like HTML and XML. Furthermore, it is possible to connect the Perl programs to C and C++ via external libraries. Ruby is a high-level programming language designed by Yukihiro Matsumoto. It has features of Perl, Python, and Small Talk. The objective of designing Ruby is to make a language powerful than Perl and object-oriented than Python. It is also open source. Therefore, the programmer can install Ruby on any platform such as Windows, Mac, and Linux. 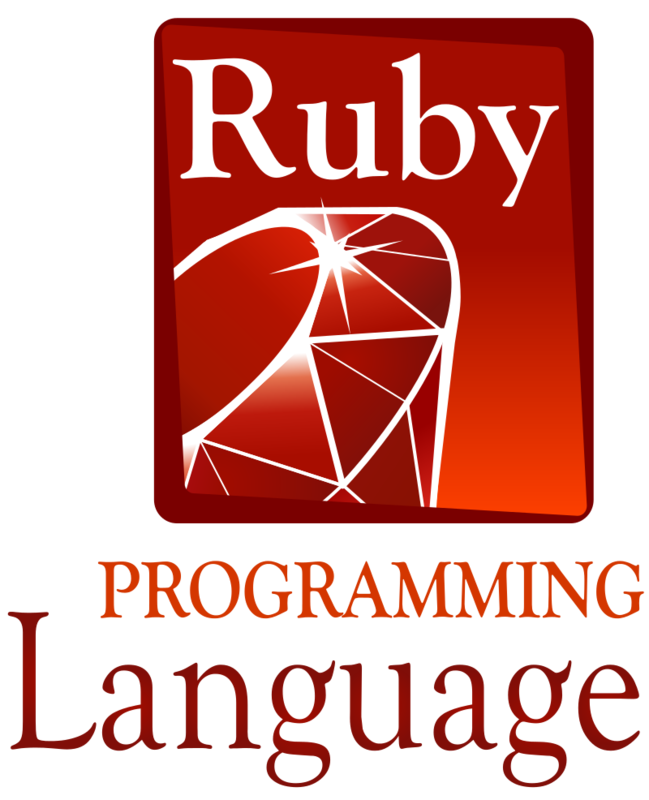 Ruby is an interpreter based language. So, it is not a fast language like C or C++. Another important property in Ruby is that it is reflective. Therefore, the program can modify its own structure and behaviour at runtime. The programmer can also easily connect the Ruby program into databases such as MySQL, Oracle, DB2, etc. Furthermore, Ruby provides support for GUI tools such as GTK, OpenGL, etc. Perl is a high level, general-purpose, interpreted, dynamic programming language while Ruby is a dynamic, object-oriented, reflective, general-purpose programming language. Thus, this is the main difference between Perl and Ruby. Larry Wall developed Perl while Yukihiro Matsumoto developed Ruby. 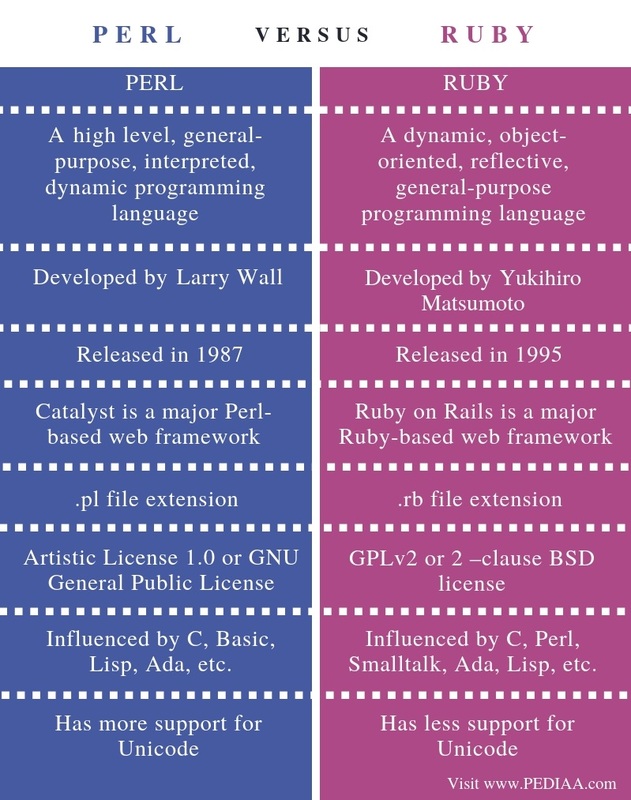 Perl was released in 1987 and Ruby was released in 1995. Catalyst is a major Perl-based web framework while Ruby on Rails is a major Ruby-based web framework. File extension is another difference between Perl and Ruby. Perl programs have the .pl file extension while Ruby programs have the .rb file extension. The license of Perl is Artistic License 1.0 or GNU General Public License. The license of Ruby is GPLv2 or 2 –clause BSD license. Hence, this is another difference between Perl and Ruby. Moreover, Perl is influenced by C, Basic, Lisp, Ada, etc. Ruby is influenced by C, Perl, Smalltalk, Ada, Lisp, etc. Unicode is another difference between Perl and Ruby. Perl has more support for Unicode than Ruby. Both these languages are easier to learn and use. Moreover, they both have large community worldwide. The main difference between Perl and Ruby is that Ruby provides more support for object orientation than Perl. 1. “Perl.” Wikipedia, Wikimedia Foundation, 26 Jan. 2019, Available here. 2. “Ruby (Programming Language).” Wikipedia, Wikimedia Foundation, 29 Jan. 2019, Available here. 3. “Perl Introduction – Javatpoint.” Www.javatpoint.com, Available here. 4. “What Is Ruby – Javatpoint.” Www.javatpoint.com, Available here.